A federal RICO lawsuit filed Monday in the Northern District of California claims a group of seven retailers, including Walmart and Abercrombie & Fitch, participated in a scheme to extort accused shoplifters. 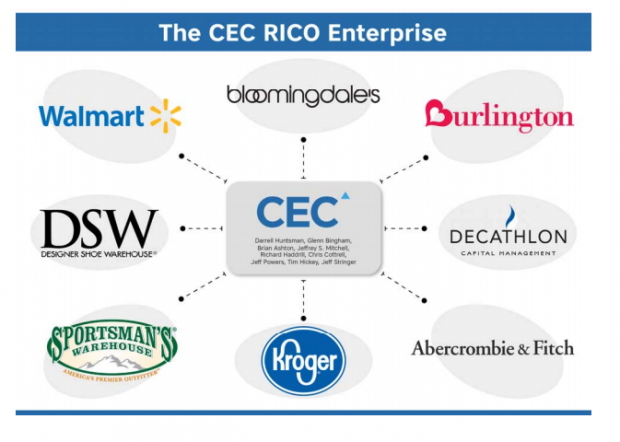 A diagram from the complaint in Doe v. Walmart, a federal RICO lawsuit filed against individuals associated with Corrective Education Co. and major retailers on April 9 in the Northern District of California. SAN FRANCISCO — The Racketeer Influenced and Corrupt Organizations Act is usually in the purview of federal prosecutors seeking to take down organized crime syndicates or drug cartels.